London, Royal Academy, from 27 June to 13 September 2009. Born a year before the founding of the Pre-Raphaelite Brotherhood, J.W. Waterhouse was too young to be a part of the movement although many of his paintings reflect its influence. The artist was however much more than a late follower. His art reveals myriad inspirations, making him a perfect example of historical painting or historical genre in the late 19th century, a hybrid of Academism, Symbolism and Naturalism. The first thing that stands out is the admirable technique and extreme refinement deployed in most of his canvases. More than in the case of other painters, Waterhouse must be judged when standing in front of the originals, as the reproductions are often unable to convey the wealth of matter and the minute nuances of his palette (and the catalogue to the exhibition is no exception). 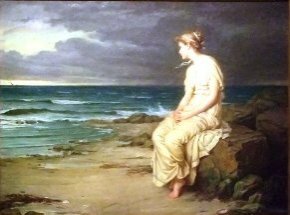 Waterhouse, unlike Gérôme for example to whom he is at times close, does not paint in a smooth way but in sweeping touches with large brush strokes and extensive impasto. 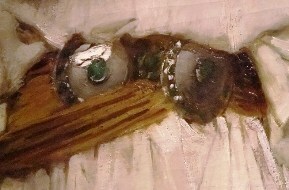 A good example of this manner can be seen in one of Mariamne’s belt buckles (ill. 1 and 2), where a white spot, in high relief, imparts the impression of reflecting a silvery light. Thus his works require attentive observation, as many details reflect an amazing virtuosity. The Waterhouse exhibition provides us therefore, once again, with the chance of asking about the relative importance of classifications in art history. Some–and one can easily imagine the criticisms raised perhaps by this retrospective if it had made a stop in France–accuse him of still painting in an academic manner up to the 1910’s, in full age of Cubism. This is of course an unfounded issue, and the truth is much more complicated than that. Let’s take a look for example at a painting like Miranda (ill. 3), with its very classical figure and the Romantic feeling it conveys (this is a Shakespearean heroine). 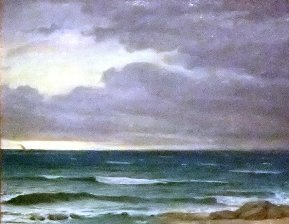 It is hard not to notice the sea in the background, still peaceful despite the approaching storm, and which could easily be attributed to Manet (ill.4). 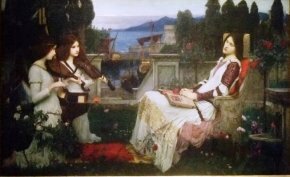 This comparison, too audacious some might say, does not intend to place Waterhouse among the moderns, which he is obviously not, despite the exhibition title. Nor does it mean that Waterhouse has to paint like the moderns to be considered a great painter. It indicates only that his work should be seen without prejudice. There are at least ten great masterpieces in this retrospective, enough to make him a great painter. The Favorites of Emperor Honorius (ill. 5), exhibited at the Royal Academy in 1883, reveals Waterhouse’s taste for rare subjects. This one is drawn from a work by Edward Gibbon, The History of the Decline and Fall of the Roman Empire. 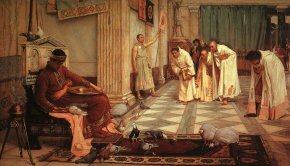 A young and incompetent emperor, Honorius is amusing himself by feeding the birds while his favorites pay court to him ; in the meantime, the Visigoth king, Alaric, was ravaging the peninsula down to Rome. The catalogue entry strangely enough does not refer to Jean-Paul Laurens. And yet, the style as well as the subject makes this a compulsory comparison. The French painter had, three years earlier, also painted a Honorius, seated on his throne, just as half-witted and decadent as Waterhouse’s. One of the essays in the catalogue however recalls the many contacts that he had with France and his ties to the art there . One of his most famous paintings, The Lady of Shalott (ill. 6), on loan exceptionally from the Tate Britain to Montreal, is thus accurately linked to another French artist, Jules Bastien-Lepage. Although the atmosphere and the theme evoke Opheli by Millais, a painting which often inspired Waterhouse, the landscape and the manner are to be seen as closer to the Joan of Arc by Bastien-Lepage. Barely remembered today in France despite the recent retrospective at the Musée d’Orsay (see article, in French), he exerted a strong influence on several European painters. The combination of certain Naturalist elements and a taste for fantastic subjects is one of the characteristics of Waterhouse’s art. This later-day Pre-Raphaelite liked fairies, sirens, sorceresses and dryads. His imaginary world is not very different from that of many Symbolist artists although few works fall totally into this category. 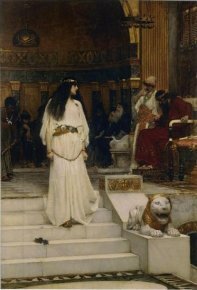 Circe Indiviosa (ill. 7) is undoubtedly one of them. Waterhouse produced images which are hard to forget. He was a painter of women, which also links him to the Symbolists. Heavy-set women from his early years such as his imposing Cleopatra (cat. 18) or his Marianne (ill. 1) majestically walking down the stairs leading her to her torture. 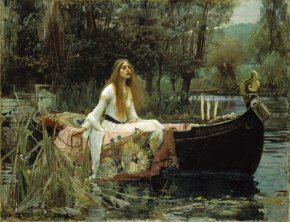 Women in love, tragic heroines such as the Lady of Shalott, Rosemonde, Marianne… In fact, Waterhouse is a deeply Romantic artist until his death in 1917, at a time when the movement had practically disappeared. We would point out in concluding that this retrospective, in the Montreal version, which we saw, is remarkably staged and presents clear signs and brief but precise explanations, a great boon for visitors. The catalogue offers both essays and entries which are quite detailed but lacks a historical background and a bibliography of the works. Those who wish to learn more in depth, should also read the monography on Waterhouse – in a French edition – written by Peter Trippi, former director of the Dahesh Museum and one of the three curators responsible for this beautiful retrospective. Elizabeth Prettejohn, Peter Trippi, Robert Upstone, Patty Wageman, J. W. Waterhouse 1849-1917.The Modern Pre-Raphaelite, Groninger Museum-Royal Academy of Arts-Musée des Beaux-Arts de Montréal, 242 p., 54 €. ISBN : 1905711360 (English edition). Peter Trippi, J. W. Waterhouse, Editions Phaidon, 2006, 251 p., 59,95 €. ISBN : 0714896713. Luc-Oliver Merson is another French artist whose works can be compared to some of Waterhouse’s paintings, such as his Saint Cecile (ill. 8).